Ferguson, Mo. – The hacker collective Anonymous launched #OpKKK and #HoodsOff this past week which took down, and took over, multiple klan websites and social media accounts while exposing numerous Ku Klux Klan members by making their personal information public. In the process of outing Ku Klux Klan members, Anonymous discovered connections between the Klan and the “We Support Darren Wilson” group. 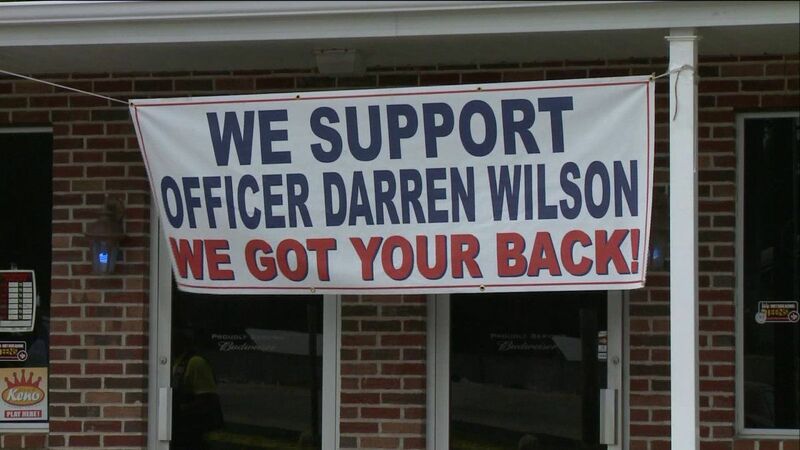 One of the Darren Wilson rallies was held in Imperial, Missouri, and was rumored to have been organized by the Klan. It’s important to note that this is also allegedly the hometown of Darren Wilson’s girlfriend and fellow Ferguson police officer Barbara Spradling. Prior to going public with the connection between the KKK and “We Support Darren Wilson” group, the group purged many photos from the rally from their social media pages, most likely in an attempt to obscure the connections between the groups. The act of erasing pictures, prior to Anonymous going public with the information, only made Anonymous more suspicious that they were onto something. The scrubbing of information raised their suspicions that perhaps there truly was a connection between Darren Wilson and the KKK. Then an informant came to Anonymous and described their direct ties to not Darren Wilson himself, but his girlfriend, fellow Ferguson police officer Barbara Spradling. Remember, Spradling is allegedly from the Imperial Missouri area where an alleged KKK supported pro-Darren Wilson rally was held. 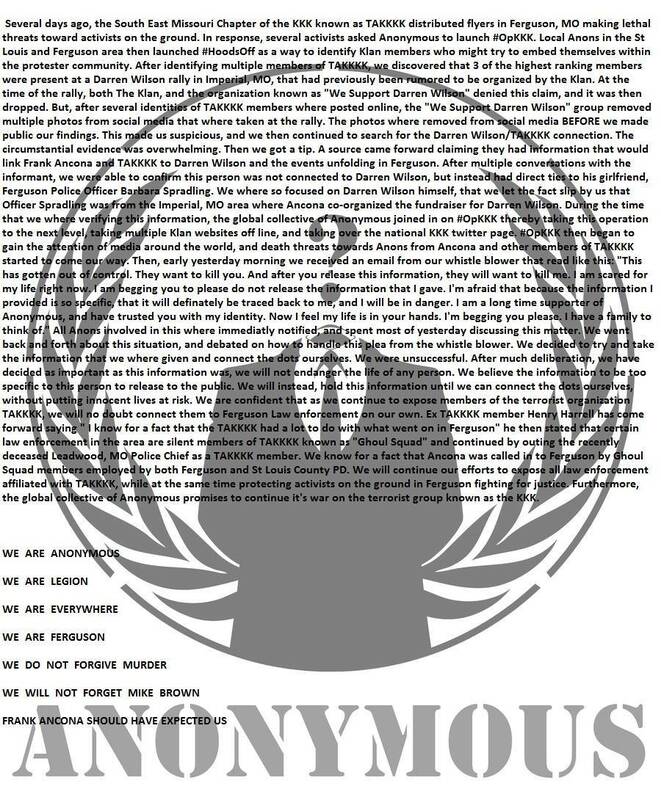 After much deliberation, Anonymous decided that the information was so specific that it would lead back to the informant, and as their goal is to preserve all human and nonhuman life, they have decided to not release the information until they themselves, without endangering the informant’s life, can synthesize and expose the information. 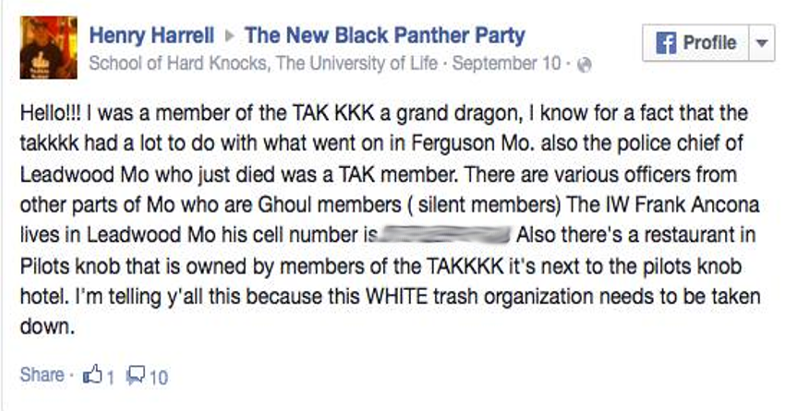 Former KKK grand dragon, Henry Harrell, has allegedly come forward to claim, “ I know for a fact that the KKK had a lot to do with what went on in Ferguson,” stating that certain law enforcement in the area are silent members of the Klan and are known as the “Ghoul Squad.” Harrell went on to say that recently deceased Leadwood, Mo. police chief was actually silent member of the Klan. Weeks after posting this, Harrell claimed that his account was hacked. According to Anonymous, they have factual evidence that the KKK was called in to Ferguson by “Ghoul Squad” members employed by the Ferguson police department, as well as the St. Louis County police department.